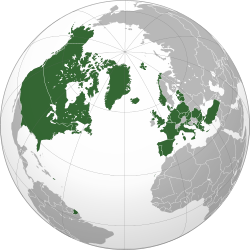 The North Atlantic Treaty Organization (NATO), or North Atlantic Alliance, the Atlantic Alliance, the Western Alliance, is a military alliance. It was established by the North Atlantic Treaty in 1949 and it was signed in Washington, D.C., USA, on April 4, 1949. Its headquarters are in Brussels, Belgium. Its other official name means the same in French, Organisation du traité de l'Atlantique nord (OTAN). NATO has two official languages, English and French, as defined in Article 14 of the North Atlantic Treaty. Its members in 1949 were: The United States, Belgium, the Netherlands, Luxembourg, France, the United Kingdom, Canada, Portugal, Italy, Norway, Denmark and Iceland. Three years later, on 18 February 1952, Greece and Turkey also joined. When West Germany joined the organization on 9 May 1955 it was described as "a decisive turning point in the history of our continent" by Halvard Lange, Foreign Minister of Norway at the time., the result was the Warsaw Pact, signed on 14 May 1955 by the Soviet Union and its satellite states as response to NATO. After the Cold War in 1999 three former communist countries, Hungary, the Czech Republic, and Poland joined the NATO. 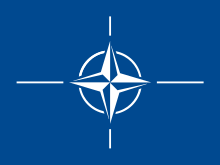 On 29 March 2004 seven more Northern European and Eastern European countries joined NATO: Estonia, Latvia and Lithuania and also Slovenia, Slovakia, Bulgaria, and Romania. Croatia and Albania received NATO membership invitation on 3 April 2008. Republic of Macedonia received only conditional invitation because it was vetoed by Greece due to Republic of Macedonia's name dispute with Greece. Asmus, Ronald D. Opening NATO's Door: How the Alliance Remade Itself for a New Era Columbia U. Press, 2002. 372 pp. Bacevich, Andrew J. and Cohen, Eliot A. War over Kosovo: Politics and Strategy in a Global Age. Columbia U. Press, 2002. 223 pp. Eisenhower, Dwight D. The Papers of Dwight David Eisenhower. Vols. 12 and 13: NATO and the Campaign of 1952 : Louis Galambos et al., ed. Johns Hopkins U. Press, 1989. 1707 pp. in 2 vol. Hendrickson, Ryan C. Diplomacy and War at NATO: The Secretary General and Military Action After the Cold War Univ. of Missouri Press, 2006. 175 pp. Hunter, Robert. "The European Security and Defense Policy: NATO's Companion - Or Competitor?" RAND National Security Research Division, 2002. 206 pp. Jordan, Robert S. Norstad: Cold War NATO Supreme Commander - Airman, Strategist, Diplomat St. Martin's Press, 2000. 350 pp. Kaplan, Lawrence S., ed. American Historians and the Atlantic Alliance. Kent State U. Press, 1991. 192 pp. Maloney, Sean M. Securing Command of the Sea: NATO Naval Planning, 1948–1954. Naval Institute Press, 1995. 276 pp. Powaski, Ronald E. The Entangling Alliance: The United States and European Security, 1950–1993. Greenwood, 1994. 261 pp. Ruane, Kevin. The Rise and Fall of the European Defense Community: Anglo-American Relations and the Crisis of European Defense, 1950–55 Palgrave, 2000. 252 pp. Sandler, Todd and Hartley, Keith. The Political Economy of NATO: Past, Present, and into the 21st Century. Cambridge U. Press, 1999. 292 pp. Smith, Jean Edward, and Canby, Steven L.The Evolution of NATO with Four Plausible Threat Scenarios. Canada Department of Defense: Ottawa, 1987. 117 pp. Smith, Joseph, ed. The Origins of NATO Exeter, UK U. of Exeter Press, 1990. 173 pp. ↑ "1955: West Germany accepted into Nato". 9 May 1955 – via news.bbc.co.uk.